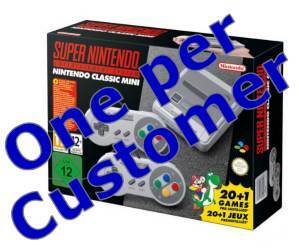 People trying to order in bulk the forthcoming retro Super Nintendo Entertainment System (SNES) are facing a more difficult task following a number of online retailers limiting orders to just one per customer. Both Amazon and Tesco have clamped down on the practice with reports that Tesco are completely cancelling orders of over 1 unit and Amazon automatically reducing customers orders to just 1 unit. GAME and the Official Nintendo Store are also imposing the same limit on their websites. This obviously affects eBay scalpers (the buying of hard to find items to re-sell for a profit) who will now find it more difficult to source multiple consoles. During the Hatchimals stock shortages in December 2017, eBay also introduced a policy of sellers only being able to sell a maximum of one per week to deter the practice. It remains to be seen if this sort of restriction is imposed again this Christmas period if SNES stock shortages persist. This week has already seen numerous eBay listings of pre-orders for up to £190 (RRP of the SNES is £69.99). Nintendo have confirmed that they will be manufacturing "significantly more units of Super NES Classic Edition than we did of NES Classic Edition", whether this will prevent the previous stock shortages of the NES Classic remains to be seen. Based on the demand seen in the last week for pre-orders, don't be surprised if stock shortages continue throughout the Christmas period.